A magnificent career was cut short earlier this year when Philip Seymour Hoffman, who almost certainly will go down as one of the best talents of his generation, passed away. While Hoffman still has some posthumous pictures coming out, A Most Wanted Man is the famed actor’s final leading role. Knowing that I was watching Hoffman’s last role made me reflect back on his career, where he played a diverse variety of characters from Truman Capote to Lancaster Dodd. Hoffman’s adaptability and ease into any role is clear as Gunther Bahmann, a German intelligence agent lost in the depths of his job. It’s a performance that’s certainly evocative of Gene Hackman’s turn as a surveillance agent in The Conversation, and while A Most Wanted Man isn’t the finest picture Hoffman has starred in, it’s a triumphant final note. Based on John le Carré’s novel, A Most Wanted Man is an intricately plotted thriller with multiple twists and turns. If you’ve read Carré’s Tinker Tailor Soldier Spy, A Most Wanted Man follows a similar path. Indeed, director Anton Corbijn and screenwriter Andrew Bovell certainly deserve lavish praise for A Most Wanted Man’s intensity: with only a few scenes with climatic action, much of the film’s thrills come from the dialogue, proving that monologues and confrontations reign over car chases and gunfire. Set in contemporary Hamburg, A Most Wanted Man sees Bachmann searching for Issa Karpov (Grigoriy Dobrygin), whose notorious father was an active member of Al-Qaeda. Though he does not share his father’s corrupt values and ideals, Karpov is tortured and interrogated by the Russian government for his familial connection and enters Germany for refuge, where he receives accompaniment and aid from liberal activist Annabel Richter (Rachel McAdams). Bachmann and his team hope to find Karpov to be able to locate his father’s hidden fortune, employing corrupt banker Tommy Brue (Willem Dafoe) to help, as well as prove Dr. Faisal Abdullah’s (Homayoun Erhadi) ties to Al-Qaeda. In the meantime, Bachmann also has to deal with his officials, weary of his previously unsuccessful missions, as well as a CIA agent played by Robin Wright. Morality and loyalty play central roles in A Most Wanted Man, and its German setting certainly plays a symbolic role to Corbijn’s themes. Hamburg was home to many of the masterminds behind 9/11, but also serves as a remnant of Cold War animosity. With its connection to both the past and present, Hamburg proves to be a hostile environment connecting the western and eastern worlds together. Corbijn uses this tension for his story to show that despite the fall of the Berlin Wall, the city, and world itself, has changed very little, with mass violence and earthly threats always beyond the horizon. Bovell’s screenplay certainly eases up the tension in and out the film. Throughout the picture, the mood of A Most Wanted Man swings up and down. Do we trust Bachmann and his agents, who act on behalf of the German intelligence, or Karpov and Richter, innocent from their accused crimes? But rather than feeling disorderly and slovenly, A Most Wanted Man maintains much of its tightness for the film’s entire durations, leading to an unexpected but strong conclusion. Not only is A Most Wanted Man a great modern day thriller, it’s a satisfying picture for Philip Seymour Hoffman fans. « What is Your Favorite Lauren Bacall Role? Really want to screen this. Thanks. I highly recommend it. Not a perfect film but one to definitely check out. I didn’t take to this film very much; though I appreciated Hoffman’s performance I thought the film was pretty average. I read a review somewhere that pointed out that more attention should have been given to the relationship between Issa and Annabel, and I think that would have helped. It’s the most emotional thing in the film, but it was hardly developed at all. The film is far from bad, but considering it was Hoffman’s last performance I was hoping for a bit more. I do agree A Most Wanted Man is an unemotional film and that the relationship between Issa and Annabel could have been built up more. But I really did appreciate the post 9/11 subtext and thought its themes made it worthwhile. Thanks! I was surprised how much I enjoyed it as well and Hoffman capped off his career with a great final leading role. Saw the trailer for this the other day. Looked strong and a bit eerie seeing PSH on screen. Great review buddy. Thanks! 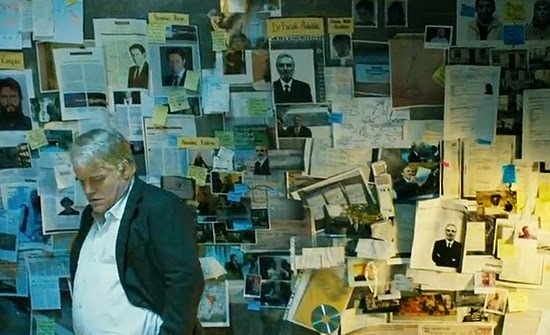 Hoffman alone is reason enough to watch A Most Wanted Man. He’s great in the picture. Great review, man. Can’t wait to see this.